Welcome to Monday Morning Quarterback, a weekly look at all the best U SPORTS stories from the week. 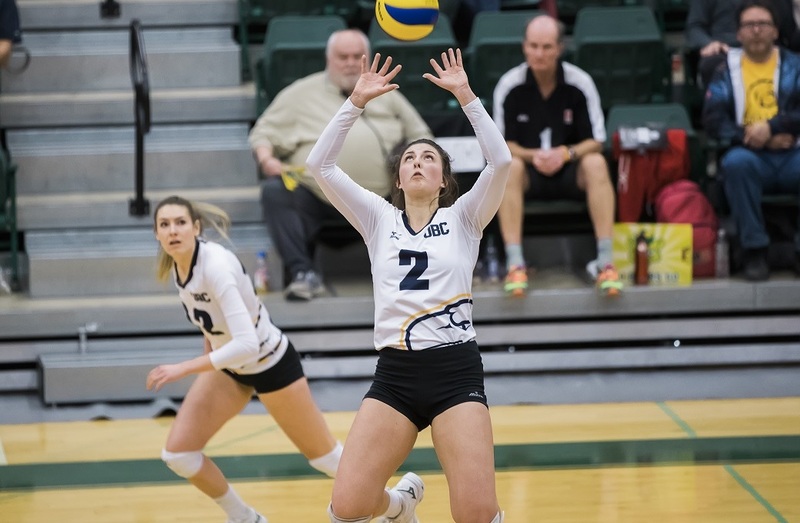 One of the best stories of the weekend came in the 2019 U SPORTS Women’s Volleyball Championship (hosted by the Alberta Pandas in Edmonton), where the eighth-seeded UBC Thunderbirds wound up victorious. UBC entered the tournament as the final seed thanks to their Canada West semifinal loss to the Calgary Dinos two weeks ago, but they wound up going on a great run through the field, taking down the top-seeded Trinity Western Spartans in five sets Friday and then beating the fourth-seeded Dalhousie Tigers in four sets Saturday. And then in Sunday’s gold-medal game, the Thunderbirds bounced back after losing the first two sets to the defending national champion Ryerson Rams to eventually win 14-25, 20-25, 25-20, 25-20, 15-11. 🏐🚺YOUR 2019 @USPORTSca CHAMPIONS, THE @ubctbirds!! For UBC, sophomore outside hitter Kiera Van Ryk led the way with 24 kills and 13 digs in the gold-medal match, while fourth-year middle hitter Tessa Davis had 15 kills and nine digs. Van Ryk was named championship MVP, and both Van Ryk and Davis were named to the all-tournament team alongside teammate Olivia Furlan, the third-year setter who had 57 assists and 13 digs against Ryerson. Thunderbirds’ head coach Doug Reimer said afterwards he was thrilled with how his team persevered after losing the first two sets. Full coverage of the women’s volleyball championship can be found here. The University of New Brunswick Reds went on a tear at the 2019 U SPORTS Cavendish Farms University Cup (hosted by the Lethbridge Pronghorns) this week, culminating with a 4-2 win over the top-seeded Alberta Golden Bears in Sunday’s gold-medal game. To get there, the second-seeded Reds edged the seventh-seeded Carleton Ravens 2-1 in the quarterfinals. They then thumped their conference rivals, the sixth-seeded StFX X-Men, by a 9-0 score in the semifinals. In Sunday’s final, second-year forward Steven Owre opened the scoring for the defending champion Golden Bears in the fifth minute of play, but rookie forwards Samuel Dove-McFalls responded for UNB two minutes later. Third-year Reds’ forward Olivier Cooper then gave his team the lead at the 14:27 mark of the second period, and second-year forward Kris Bennett made it 3-1 shortly afterwards. Third-year forward Brandon Magee brought Alberta back within one at 6:47 of the third period, but rookie forward Mark Rassell capped things off for the Reds with some insurance just over four minutes later, and UNB hung on for the victory. Fourth-year goaltender Alex Dubeau made 34 saves for the Reds in the win, and UNB head coach Gardiner McDougall said afterwards his team’s defensive effort was crucial. Full coverage of the men’s hockey championship can be found here. 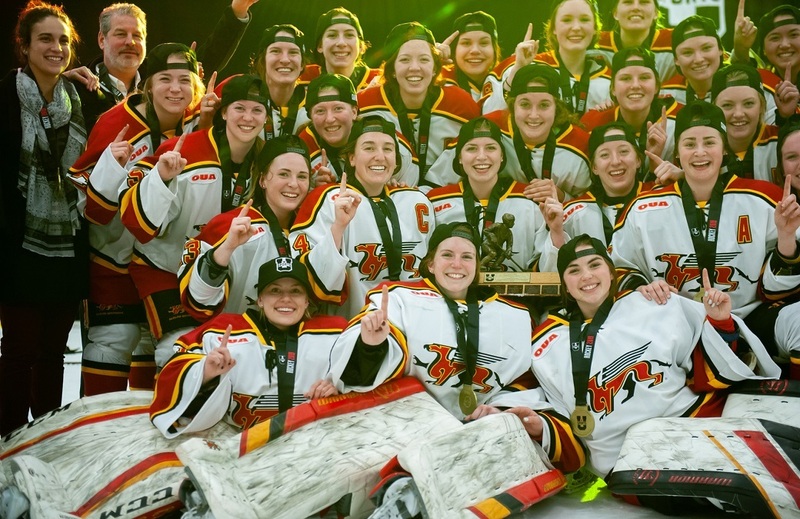 The Guelph Gryphons had a remarkable run at the U SPORTS Women’s Hockey Championship (hosted by the UPEI Panthers in Charlottetown) this week, capping that off with a 1-0 win over the McGill Martlets in Sunday’s gold-medal game to claim the Golden Path Trophy and the first national championship in program history. To get there, third-seeded Guelph beat the sixth-seeded Manitoba Bisons 3-2 in the quarterfinals and the second-seeded Montreal Carabins 5-0 in the semifinals. 🚺🏒| Final Score: The Gryphons defeat the Martlets 1-0 to claim the 2019 @USPORTSca Gold Medal! Full coverage of the women’s hockey championship can be found here. The 2019 U SPORTS Men’s Volleyball Championship Presented by Hôtel Universel Québec, hosted by the Laval Rouge et Or in Quebec City, saw the Trinity Western Spartans lift the Tantramar Trophy for the sixth time since 2006. The second-seeded Spartans did that by beating the seventh-seeded McMaster Marauders in four sets in the quarterfinals, the third-seeded Rouge et Or in five sets in the semifinals, and the top-seeded Brandon Bobcats (who topped them in five sets for the Canada West championships last weekend) in straight sets in the finals. This marked their fifth straight appearance in the national finals, and their third win in that span; they also claimed national titles in 2016 and 2017, and came away with silver in 2015 and 2018. Full coverage of the men’s volleyball championship can be found here. The 2019 U SPORTS/Curling Canada Curling Championships (hosted by the UNB Reds in Fredericton are still ongoing, with semifinals taking place Monday night. Through Sunday’s matches, the Dalhousie Tigers led the standings on both the men’s and women’s sides, with the Matthew Manuel-skipped men’s rink and Kaitlyn Jones-skipped women’s rink both holding 5-1 records. Manuel’s team posted a 10-3 win over the Western Mustangs and an 8-7 win over the Alberta Golden Bears Sunday, while Jones’ team fell 8-5 to the Laurentian Voyageurs but then beat the Reds 7-4. Other top teams on the men’s side after Sunday’s draws included the Golden Bears, Carleton Ravens and Memorial Sea-Hawks (all 4-2). On the women’s side, the Queen’s Gaels (5-1) were right there with the Tigers, with the Alberta Pandas, Brock Badgers and Voyageurs all at 4-2. Full coverage of the curling championships can be found here. The other medals for Canada in this competition were a silver in men’s curling (an Alberta Golden Bears’ rink skipped by Karsten Sturmay), a gold in men’s snowboard cross (by Western’s Will Malisch) and a bronze in women’s snowboard cross (by Laval’s Audrey McManiman).All in all, 121 athletes and staff represented Canada in these games. #uCAN closed out @Krasnoyarsk2019 with an incredibly entertaining @FISU ceremony. Meanwhile, the 2019 Junior/Senior Canadian Wrestling Championships in Saskatoon this coming weekend will see plenty of U SPORTS wrestlers hoping to progress towards qualification for the 2020 Tokyo Olympics, including Calgary Dinos alumna Erica Wiebe. Wiebe is set for a high-profile 76 kg showdown with Justina Di Stasio of the Burnaby Mountain Wrestling Club; Di Stasio was crowned world champion at 72 kg back in October, but Wiebe (the 2016 Olympic champion, who picked up a bronze in October’s world championships at 76 kg) beat Di Stasio head-to-head the last time they wrestled at the women’s team trials. Elsewhere, the Canadian men’s basketball team led by Ryerson coach Roy Rana (and featuring several U SPORTS alums, including Carleton grads Phil and Thomas Scrubb) made it through qualification for the FIBA Basketball World Cup 2019 in China. Saturday’s draw indicated that Canada will be placed in Group H, and will face Australia (September 1), Lithuania (September 3) and Senegal (September 5) in the first round. And also in basketball, the Canadian Elite Basketball League draft (including two rounds focused on U SPORTS talent) was held Saturday, with the results to be unveiled this coming week. And this week also saw U SPORTS put out a statement supporting the Canadian government’s new safe sport initiatives. 🔊 Statement from U SPORTS regarding @SportCanada_EN announcements on safe sport. 🔊 Déclaration de U SPORTS au sujet des annonces du @SportCanada_Fr sur la sécurité dans le sport.